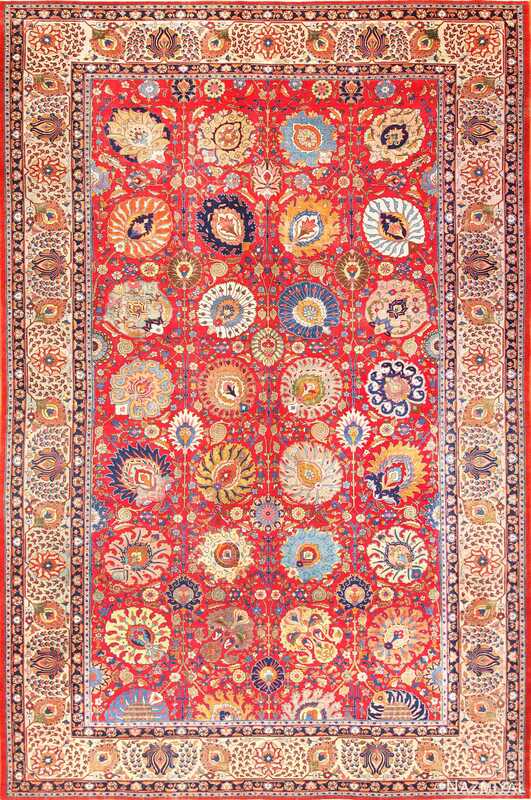 Brimming with vibrancy, this antique Persian rug features a pattern of large floral elements spilling over a bright red field. 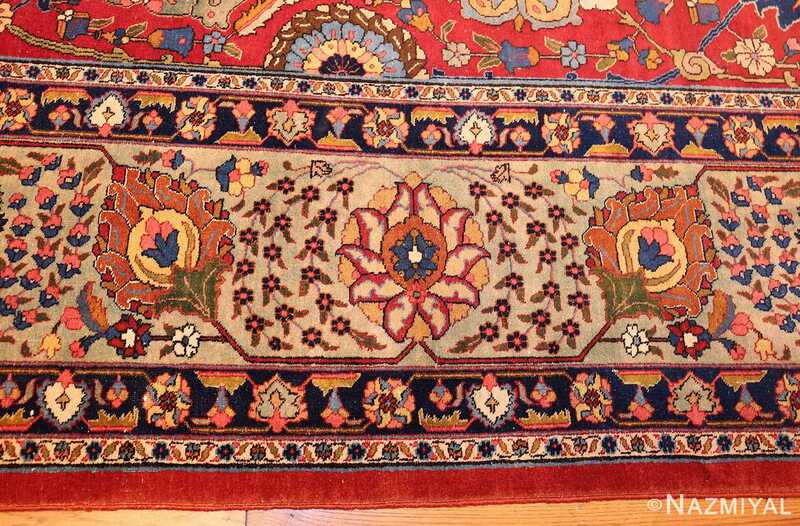 Each symmetrical blossom in this impressive antique Persian Tabriz rug in artfully ornate and crisply stitched, making use of multiple colors to create distinct appearances. Allowing a meditative search for comparisons, no two ornaments are exactly alike. Smaller flowers fill the vivid spaces between, captured in enduring hues of blue, yellow and white. Delightfully complex borders enclose the alluring central field, each band containing its own cleverly designed floral elements. 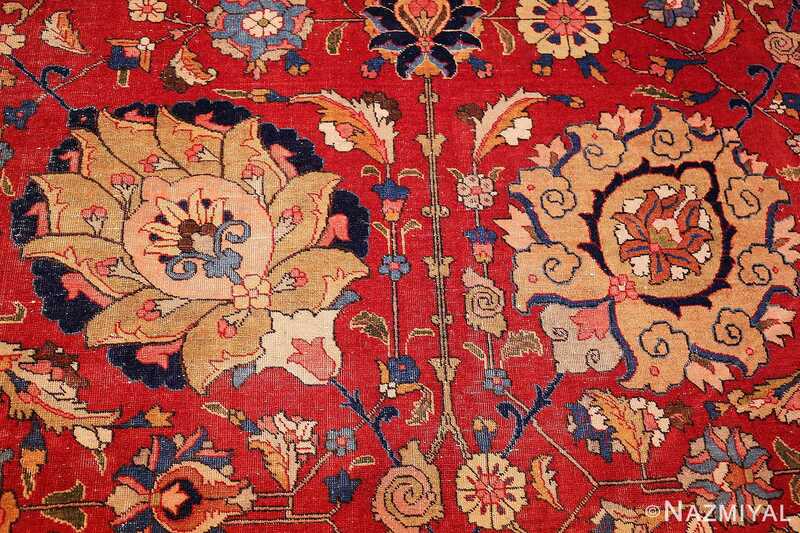 The sumptuous decorations through the widest border are detailed down to the smallest petal, carrying the vivacious theme around the entire antique carpet. Beautiful Large Antique Vase Design Persian Tabriz Rug 49196 Country of Origin / Rug type: Persian Rug, Circa Date: 1920 – The bold, beautiful all over floral design of this magnificent large antique vase design Persian Tabriz rug makes a grand statement in any room. A fascinating oversized floral garden patterns delights the senses and fills the field of this masterfully designed piece of art. 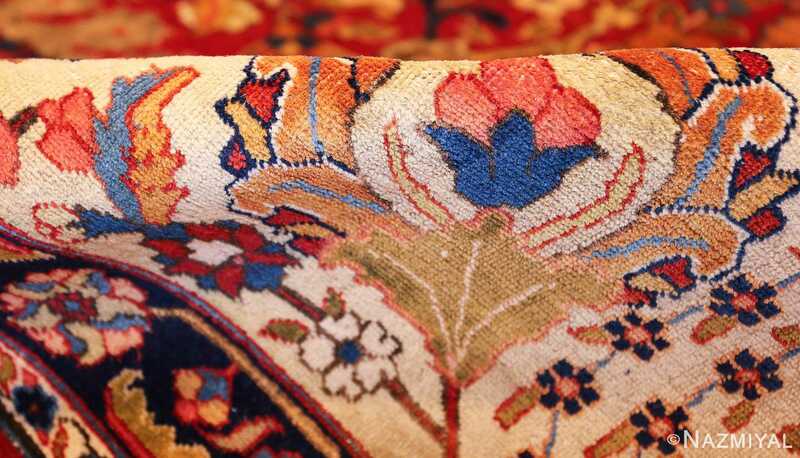 The finer details of the antique vase design Persian Tabriz rug give it an elegant characteristic, yet it retains a touch of its tribal roots through its lack of repetition in the floral patterns of the field and through its bold colors. The artist chose a wide range of both warm and cool colors, tempered by earthy greens and browns. 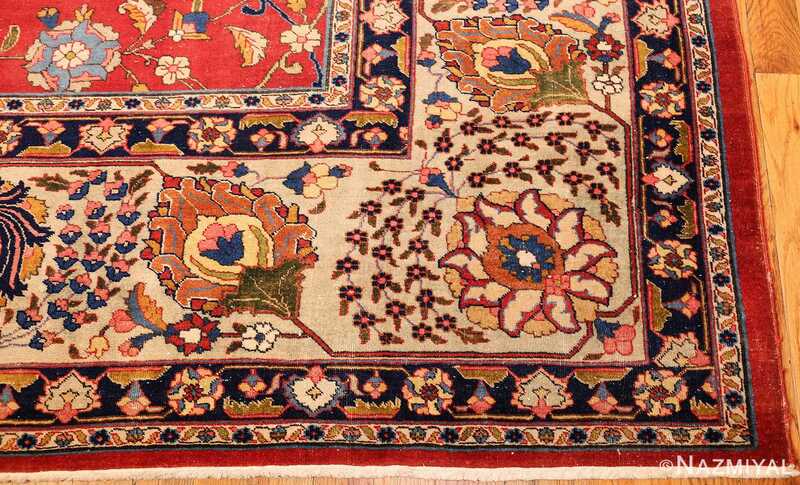 Each floral design is unique in the field of the rug, which balances with the symmetry found in the main border of the large size antique Persian rug from Tabriz. It uses symmetry in the pattern, but not in the colors chosen. 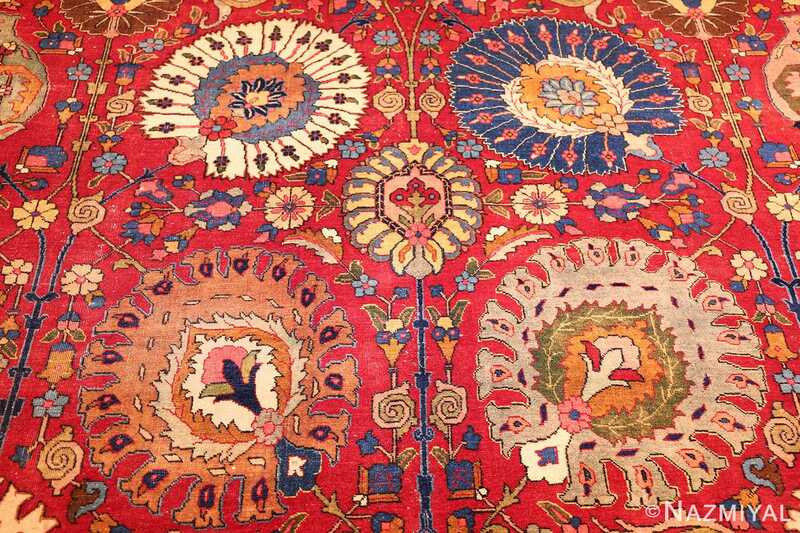 This gives the antique Persian rug balance, but still allows the artistic choices of a highly creative artist to be enjoyed in their full expression. 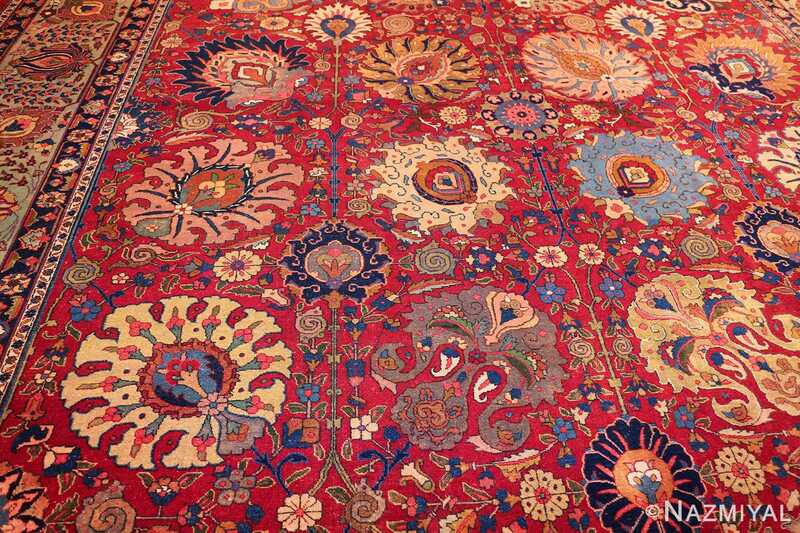 This large size antique vase pattern Persian Tabriz carpet is beautiful enough to grace the palace floors of the Persian Empire. The colors chosen give it a whimsical, vibrant feel. It has small spiral elements that are reminiscent of snails crawling up the stems and leaves of the plants. The stylized elements of the Persian Tabriz rug allow it to retain the tribal characteristics of the traditions surrounding it. 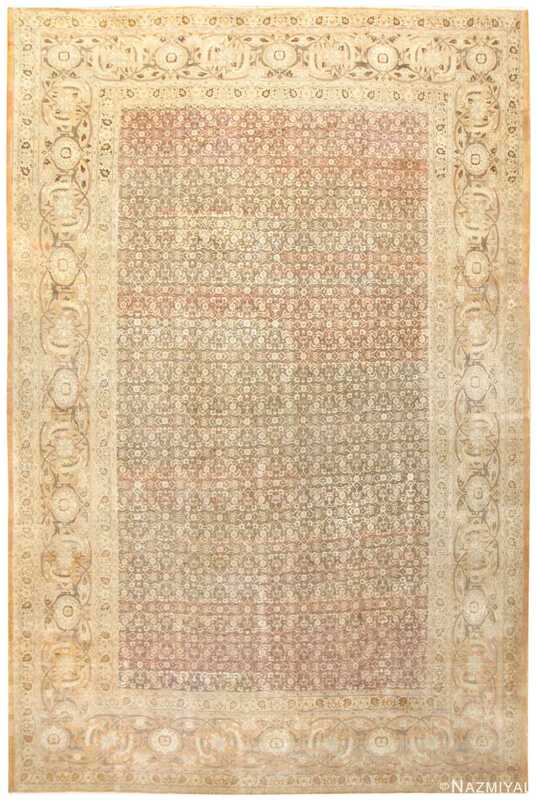 This Persian carpet would go well in any traditional or contemporary interior room that needs a magnificently artistic and breathtaking carpet with a unique design to add color to the palette. 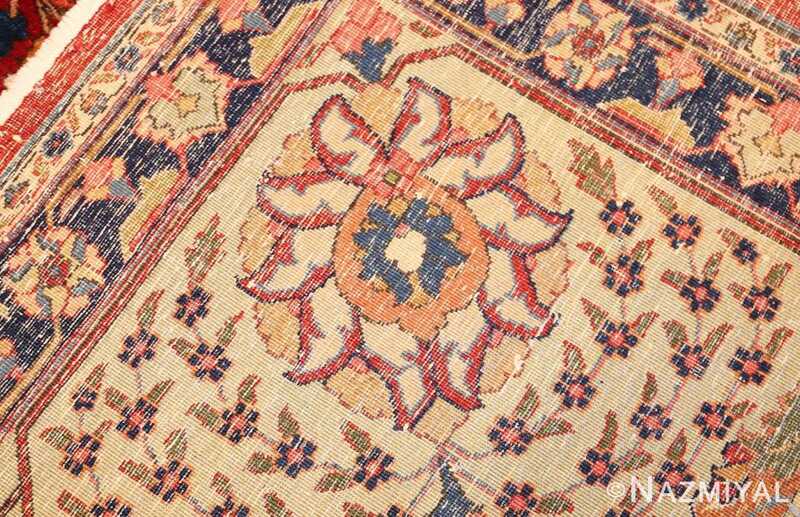 It goes without saying that this antique rug from Persia will garner much love and appreciation from all who cross its path. 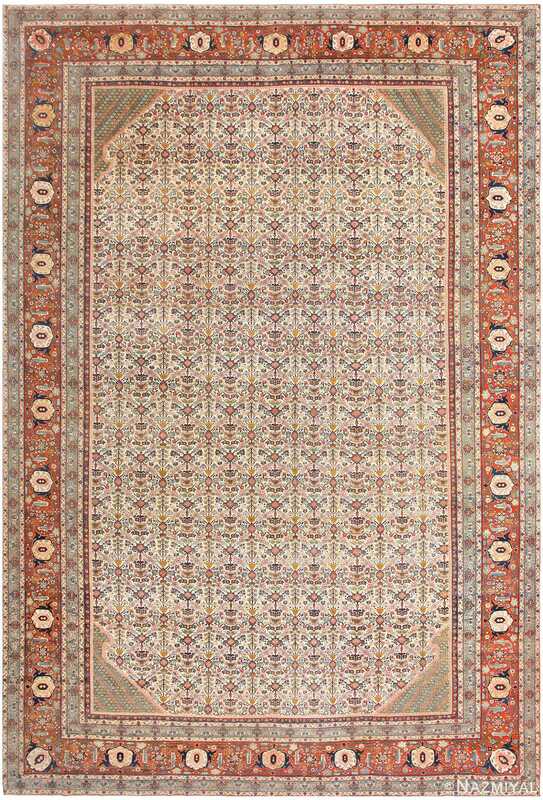 The austere elegance of the open field format on this regal antique Tabriz is enlivened by fine, detailed patterning.